The shape of the garment. The first visual impression of the garment is its shape. At first glance, you can determine a pregnancy or narrow, long or short, it suits the person or not. 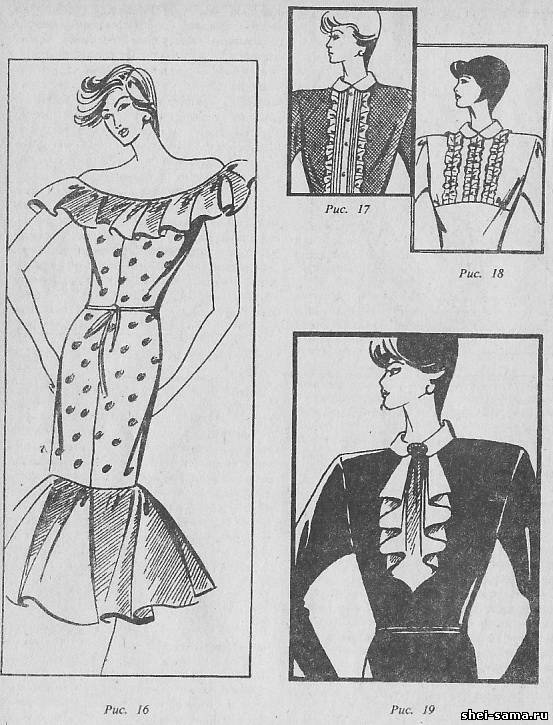 Fashion story knew-fitting, tapered dress form and shape, approaching to a square, the ball. 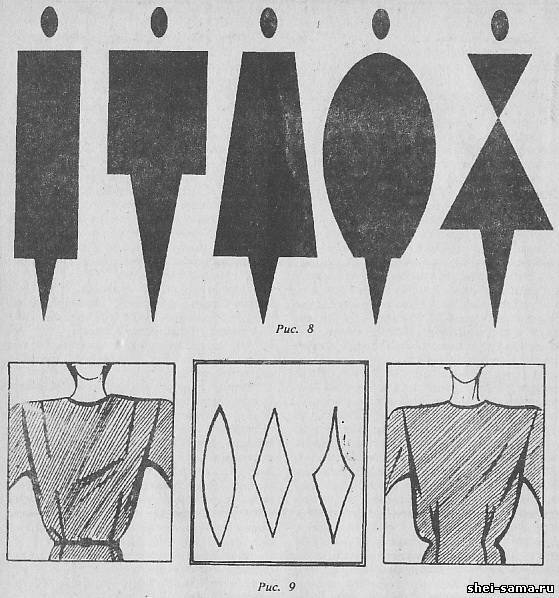 The contour shape of the dress is called the silhouette. Each mode offers its silhouettes. It is possible to trace changes in fashion over a certain period of time. 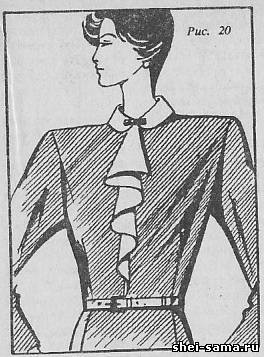 Consequently, the silhouette is the spokesman of fashion. Conventionally, the silhouettes compared to geometric figures: rectangle, square, trapezoid, oval, triangle (Fig. 8). Sometimes referred to the letters: "X", "A", "N", etc. types of silhouettes can be compared with the barrel, Tulip, umbrella, clarinet, etc. Uniforms must conform to the human figure and fashion trends. Fashion and makes the right choice. The fitted silhouette will accentuate the waist line. (Can we afford it?) Straight - very comfortable and convenient, but it hides the outline of the figure. Silhouette a-line with lots of tails will not everyone. But poluprilegayuschy only slightly outlines the contours of the figures and is suitable for almost everyone. Complete women prefer this option. The important point in the choice of form is the determination of the length of the product. Length depends on the direction of fashion and the human figure. Changing the direction of fashion change the length. In recent years fashion has become more democratic. The proposed length - from mini to Maxi. It is always important to find "your" length, only then can you feel confident. We must remember that the long clothes can make a person slender or, on the contrary, heavy, short - emphasize the youthfulness or open not quite slender legs. 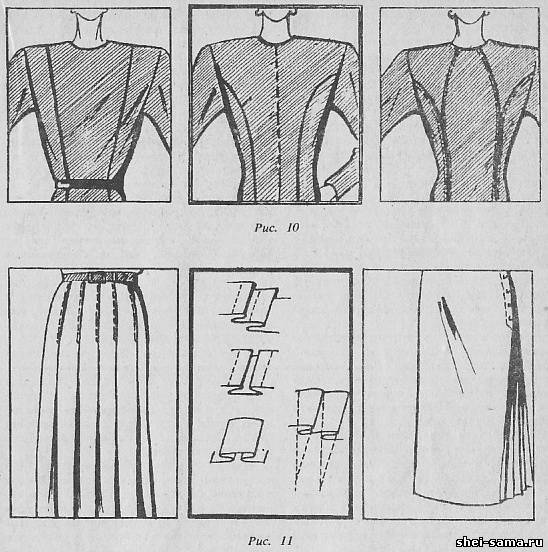 To find the correct length, then to determine the correct proportions of clothing.But the proportions is not only the ratio of the length of the product to the human figure, but the length of the skirt to the length of the jacket, the width of the sleeves to the bodice and the entire silhouette, etc, we are thinking about in advance, and then Refine the fitting. Correct proportions and beautiful forms of clothing bring figure to the ideal suggested by fashion. Uniforms create constructive and decorative lines - Darts, reliefs of various configurations, assemblies, smocking, draping, pockets, undercuts, tails, flared. The constructive lines, connecting parts and clothing items. This - joints, tuck etc to the contours of clothing items. Design should not be random, it must correspond to a silhouette and make a single whole with it. Tuck can be located on the edge of the part or in the middle of it, to be open and closed, simple and curly (Fig. 9). Figure 10 shows the various types of reliefs. Also important, and creases. They are one-sided, inverted and box (Fig. 11). In addition to three-dimensional form pleats create some relief on the surface, especially this kind of folds, like pleats,. Build also creates the volume and are obtained by contraction of the material of one or two parallel connected strands. They are widely used in modeling various parts of the clothes. The smocking is used to create clothing loose bodice and a shoulder seam. The smocking creates a relief on the surface of the material and, therefore, are simultaneously finish. Three-dimensional shape with a unique surface topography generates, and the drape is loose or falling folds of different nature and their subsequent fixation (Fig. 12). It is usually performed on a thin elastic fabrics, crepe weave of silk and wool. To get smooth flexible folds, the material cut out in an oblique direction of the thread. 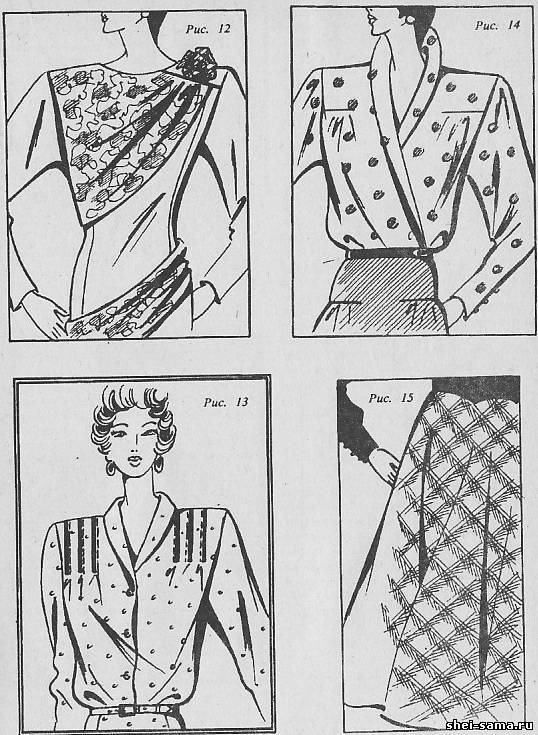 Pintucks - numerous small, closely spaced from one another by folds or tucks. They are partially zastrahovatsja and over soft folds (Fig. 13). With the help of pockets, like using assemblies, you can get free products. An interesting approach is undercut. For this purpose, the tissue is partially cut, the excess it with one hand going to the Assembly or the band folds, then the two edges of podraza grind off the connecting seam. The undercut can create a bulge on the chest or hips and at the same time is a kind of art product design (see Fig. 14). When creating a product is very often used cut bottoms. It is obtained by cutting out parts of the funnel-shaped form at an angle of 45" to the warp threads, with the result that the figure under the weight of the tissue form a soft tail (Fig. 15). Products made out of various types of finishes. This is also a line, but decorative. A common decoration of the clothing are ruffles, ruffles, ruffles, frill, kokila. Shuttlecocks (Fig. 16) are of two types. Sometimes it's a straight strip of fabric cut on the bias thread. Pritachivajut side gather, or lay small frequent folds. In other cases, they cut out strips of the spiral or the ring and pritachivajut to the product of the inner slices. These shuttlecocks is usually performed in fancy articles of silk fabrics. Ruffles (Fig. 17) represent different widths of strip material, ruched on one side and this side is sewn to the product. Ruffles cut in a straight line. Ruffles (Fig. 18) - is also a strip of material gathered in the middle. Edges should be processed on the machine or by hand. The ruffle is performed either from the material or from different materials. Frill (Fig, 19) is removable or vacana into the neck finishing detail. In a cut is an incomplete round or drop shape. Ready-made stylish fit the uniform folds. Kokila (Fig. 20) - this is a finishing detail, formed by two circles drawn from one point with a smooth decrease of the radius to the intersection of the outer circle to the inner. Kokila attached to the middle of the front inner cut. External cut to drape freely under the weight of the fabric.